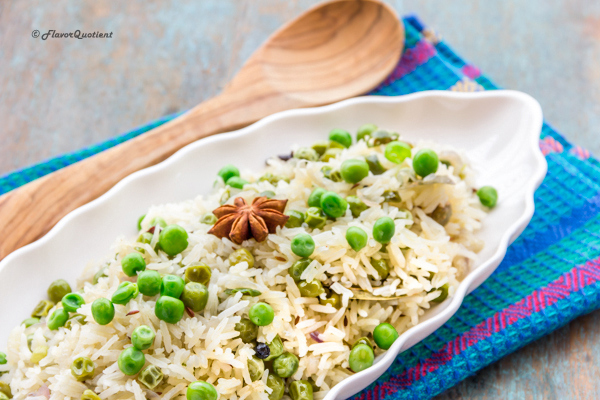 Green peas’ pulav is a classic offering from my very own Indian cuisine which is full of seasonal flavors. It’s best for the winters when green peas are in abundance and you could make full use of this seasonal produce. 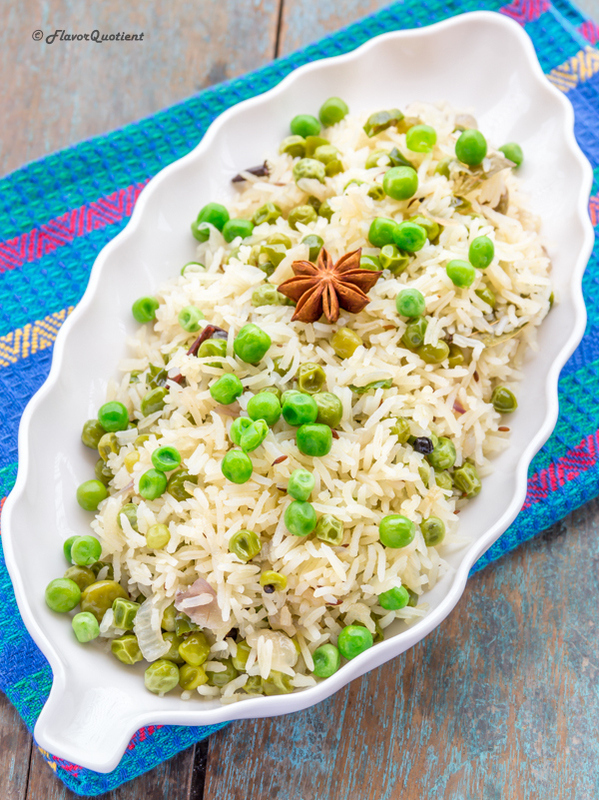 Green peas pulav is a fixed member in any Indian eatery be it summer or winter but it tastes best during the cold times due to the seasonal freshness in the green peas and the supply is plenty. 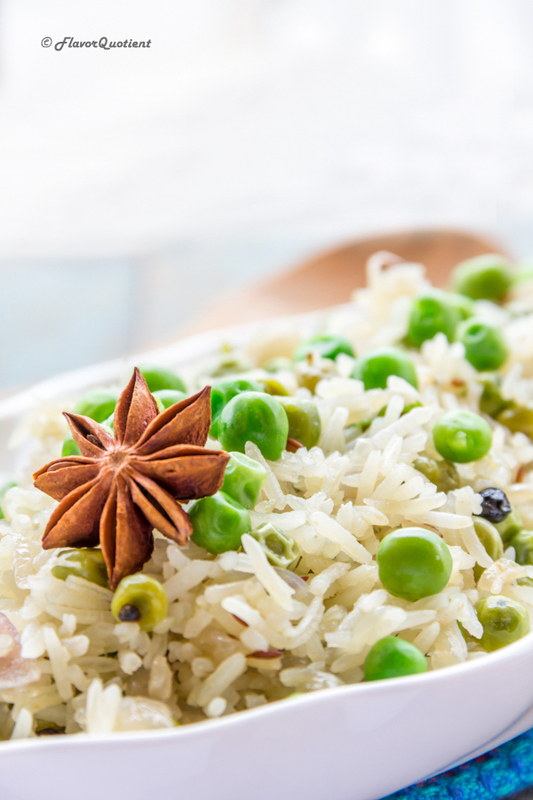 Green peas are generally used to add a touch of freshness in most Indian curries but it is the star of the peas’ pulav. Pulav means ‘flavored rice’ which is traditionally flavored with ghee ie clarified butter and mix of whole spices. 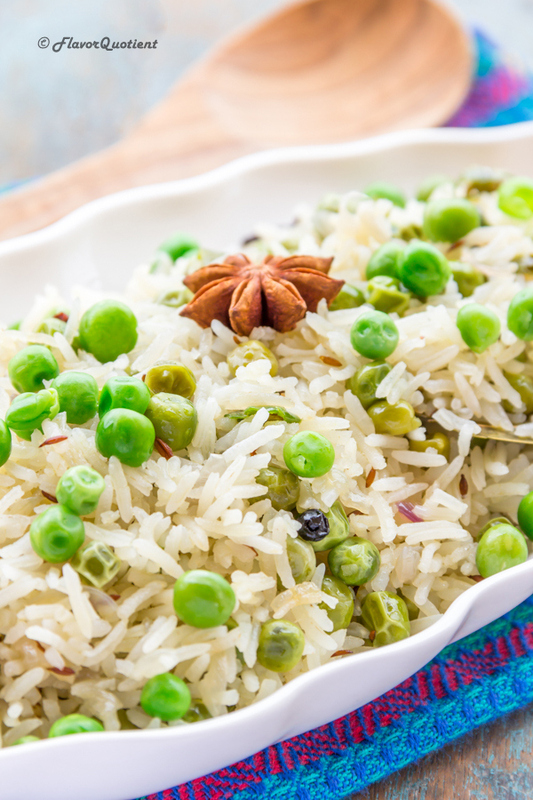 When you throw in lots of green peas to the flavored rice, you get an ultra-flavorful peas pulav! The color combination of the tiny green balls mixed with fluffy white rice is an instant mood-enhancer; don’t you feel so too? The traditional way of cooking pulav may seem intimidating; at least to me it is. So I have customized it to adhere to my comfort level and it is now as easy as a quick stir-fried rice. If you want to follow the classic method of cooking a pulav, you would have to cook the rice along with the spices by adding the right amount of water so that all the water is absorbed at the end of cooking and you end up with a perfectly cooked fluffy rice. I had tried this method few times and failed. I failed because the rice didn’t turn up as fluffy as I would like it to be. It was still edible and tasty though but I like my pulav super-fluffy and zero sticky. So I adapted this method of pre-cooking the rice till ¾th done and then finish rest of the cooking in the pan by stir frying with the spices. Wash and soak the rice for 30 minutes. Bring a large pot of water to boil and lightly season it with salt. Once the water comes to boil, add the drained Basmati rice and cook until just ¾th done. This would not take more than 10 minutes. Drain the rice and let it cool down completely. I suggest to prepare the rice much ahead of time so that you can work with completely cold rice in the later steps. If you are using fresh green peas then cook them in salted boiling water until soft. Drain and set aside. Skip this step completely if using frozen peas. Make a paste of ginger and green chillies in a blender adding a little water if needed. Heat oil in a non-stick pan on medium flame. Once oil is hot, add cumin seeds, bay leaves, cloves, cinnamon, cardamom, peppercorn and star anise. Sauté them until fragrant. Then add chopped onion and sauté them until they become translucent but not too brown. Add ginger-chilli paste and saute it for another 1 minute. Then add garam masala and coriander powder and stir well. Add a splash of water to prevent the spices from burning. add the sugar and season with salt to taste. Next add the green peas and the rice and mix using two forks to coat the rice and peas well with the spices and everything is heated through. 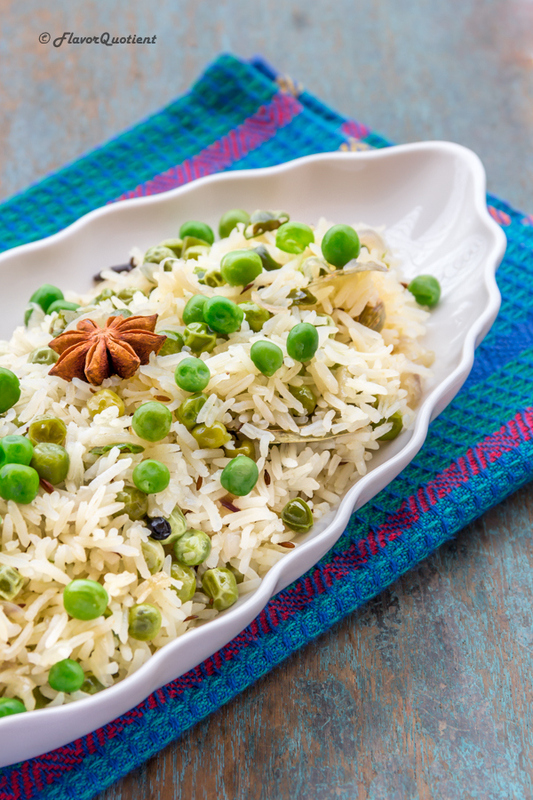 Green peas pulav is ready to serve with some spicy Indian curry!